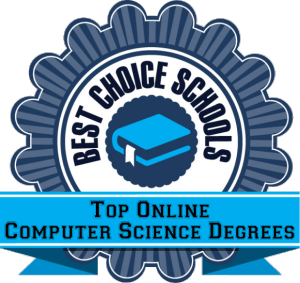 In this article, we highlight the 20 best online schools for computer science bachelor’s degrees in 2017. We live in a technology-driven world where some of the highest paying careers are in computers. But, not everyone can secure a job in this fast-growing field, especially without adequate education. Earning a bachelor’s degree in computer science, or a closely related discipline, is often the first step to job placement. Thankfully, some of the best schools in the country offer undergraduate computer science programs. There is no need to quit your current job or forego your family responsibilities in order to return to school. You can complete an online computer science degree that offers flexibility without diminishing quality. Accredited institutions with rankings from major publications offer online computer science bachelor’s degrees. We looked at 82 accredited colleges and universities that offer online bachelor’s in computer science or related degree programs as per NCES College Navigator. To determine our final list of schools, we examined the percentage of applicants admitted (selectivity rate), graduation rates, student-to-faculty ratios, and undergraduate tuition according to College Navigator. We synthesized the collected information to develop our list of the 20 best online schools for computer science. In the case of a tie, schools were given a higher ranking if their tuition was lower. The methodology we used to determine our list of the 20 best online schools for computer science is below. Regent’s high graduation rate earns it a spot on our list of best online schools for computer science. Regent University is one of our top choices for online schools for computer science bachelor’s degrees due to the institution’s reasonable in-state, undergraduate tuition price and relatively high graduation rate. The program is offered entirely online and requires 120 total credit hours that include 49 general education credits, 54 computer science credits, and 17 elective credits. Required computer science courses include computer architecture, data structures and algorithms, ethics for computer science, mobile and smart computing, operating systems, and software engineering. Regent University is ranked by major publications like U.S. News and World Report as a best national university. Also, the school’s online bachelor’s programs rank #17 out of more than 1,200. University of Maryland offers an affordable online computer science degree program. One of the best online computer science schools on our list is the University of Maryland University College. The school offers a highly affordable online computer science bachelor’s degree program that is designed for working and busy adult students who require a flexible class schedule. All classes are delivered online and include computer graphics, computer systems and architecture, data structures and analysis, introduction to discrete structures, introductory programming, and object-oriented and concurrent programming. Several computer science related minors are also available, including cybersecurity, digital media, information systems, and small business management. The university has earned national rankings from U.S. News and World Report as a best national university. Affordable undergraduate tuition makes National University one of the best online schools for computer science on our list. National University is on our list of the best online schools for computer science due to its reasonably low student-to-faculty ratio and affordable undergraduate tuition. The school offers a bachelor’s in computer science degree program that may be completed entirely online. All classes are delivered via distance learning, using contemporary technology and modern practices. Online courses include algorithm design, computer architecture, computer ethics, database design, digital logic design, programming languages, and scientific problem solving. Students must also complete two 400-level technical electives in computer science or computer information systems to satisfy graduation requirements. According to major publications like U.S. News and World Report, the university’s online bachelor’s programs rank #114 out of more than 1,200. Franklin University’s bachelor’s in computer science is offered entirely online. Franklin University earns a top spot in our list of the best online computer science schools primarily due to the low student-to-faculty ratio and reasonable undergraduate tuition costs. Also, the school’s online bachelor’s degree programs rank #106 out of more than 1,200 programs in the most recent publication of U.S. News and World Report’s Best Colleges. Franklin offers a bachelor’s in computer science that may be completed entirely online. The program is designed for working students who require flexible class schedules and 24/7-access to course content. Online courses include coding and testing, computer architecture, database management, object-oriented design, quality assurance, and web application development. Baker College is one of our top picks for best online schools for computer science. Baker College is one of the top online computer science schools primarily due to its affordable undergraduate tuition and student-to-faculty ratio. Students may earn a bachelor’s in computer science degree entirely online by taking classes taught by university professors. Required courses may include computer architecture, C++ programming, data structures and algorithms, introduction to programming, microprocessor electronics, programming for mobile devices, and trends in computer science. Baker College is accredited by The Higher Learning Commission and is an Academic Quality Improvement Program (AQIP) participant. Also, the school has earned rankings from major publications like U.S. News and World Report as a best regional college in the Midwest. Regis University’s high grad rate and low student-to-faculty ratio make it a top choice for best online schools for computer science. While Regis University is costly, the school offers a low student-to-faculty ratio and high graduation rate, making it one of the best online schools for computer science. Regis’ College of Computer and Information Sciences offers a BS in computer science degree program that may be completed entirely online. The program is accredited by the Computing Accreditation Commission of ABET, a prestigious and nonprofit accrediting body. All classes are delivered online and taught by university professors with years of experience in the computer industry. Required courses include advanced programming and algorithms, computational foundations, introduction to programming, mobile and enterprise computing, and web and database applications. Regis is a regionally ranked institution. In fact, U.S. News and World Report ranks the school’s online bachelor’s programs 92nd out of more than 1,200. Lewis University is one of the best accredited online schools for computer science. Lewis University is listed among our top online computer science schools due to the low student-to-faculty ratio and high graduation rate. The school offers an accelerated bachelor’s in computer science degree that may be completed entirely online. Eight-week courses are designed to accommodate working professionals and busy students in need of balancing work, family, and educational responsibilities. Students have access to course materials 24/7 and are able to work at their own pace. Courses may include advanced communications and networking, computer infrastructure, operating systems, and programming languages. Lewis University is regionally ranked by major publications like U.S. News and World Report as a best regional university in the Midwest. Liberty University’s online bachelor’s in information systems program has four specializations. Liberty University’s low student-to-faculty ratio, high admission selectivity rate, and reasonable graduation rate earn it a spot on our list of top online computer science schools. For those interested in accredited computer science schools online, Liberty offers a bachelor’s in information systems with four available specializations. These specializations include accounting information systems, data networking, database, and information assurance. All classes are taken online and taught by the same professors who teach on the Lynchburg campus. Liberty is a nationally ranked institution. In fact, U.S. News and World Report rank the school’s online bachelor’s degree programs #100 out of more than 1,200 programs surveyed. University of Illinois’ low student-to-faculty ratio is one of the reasons for being on our list of best online schools for computer science. The University of Illinois is among our best online computer science schools for a bachelor’s in computer science because of the low student-to-faculty ratio, reasonably affordable undergraduate tuition, and graduation rate. Students interested in computers may earn a bachelor’s in computer science without having to attend traditional classes. The online degree is designed for working students who require flexible scheduling in order to balance work and life obligations. All classes are delivered online and include applied statistics, computer programming concepts, discrete structures, programming languages, and software engineering. The university is ranked by U.S. News and World Report as a top regional university in the Midwest. Also, the school’s online bachelor’s programs rank #30 out of more than 1,200 surveyed programs. Colorado Tech’s online bachelor’s in computer science is an affordable program. Colorado Technical University’s affordable tuition and low student-to-faculty ratio earn it a spot on our list of online computer science schools. Busy students may attend classes entirely online through Colorado Tech’s bachelor’s in computer science program. Classes may include computer architecture, data structures, intermediate python programming, software engineering methods, and software processes. The program is designed to prepare students for careers as applications engineers, software developers, or web developers. Colorado Tech is ranked by major publications like U.S. News and World Report. In fact, the most recent edition of Best Colleges lists the school’s online bachelor’s programs #63 out of more than 1,200 surveyed programs. OSU is one of our top online schools for computer science! Oregon State University is one of our top online computer science schools due to its high graduation rate and low student-to-faculty ratio. Also, the school’s affordable undergraduate tuition is an added bonus for students on a budget. The BS in computer science program offers one-year, two-year, three-year, and four-year track options. According to the program website, the one-year track is for those who are able to be full-time students and handle the rigorous course load. All classes are delivered online and include computer systems and networking, databases, mobile and web development, programming fundamentals, and software engineering. OSU is a nationally ranked institution. Also, U.S. News and World Report ranks the school’s online bachelor’s programs #7 in the country. This is another reason why Oregon State is on our list of best computer science schools online. Low student-to-faculty ratio and affordable tuition make OIT one of the best online schools for computer science. Oregon Institute of Technology is one of the best online computer science schools for those interested in IT careers. OIT earns a spot on our list of best online schools due to its affordable tuition price and low student-to-faculty ratio. The institution is also nationally ranked and recognized by major publications like U.S. News and World Report. In fact, the online bachelor’s programs, including IT, rank #199 out of more than 1,200 surveyed programs. All classes are delivered online and taught by university professors with significant IT experience. Courses include database programming, programming fundamentals, relational database design, and systems analysis. Accelerated online computer science programs are available at Dakota State University. Dakota State University is one of our top online computer science schools because of the affordable undergraduate tuition and graduation rate. The school offers an online bachelor’s in computer science with classes taught by university professors. There is even a 4+1 program that allows students to accelerate their studies toward a graduate computer science degree. Online courses include algorithms and optimization, assembly language, operating systems, programming languages, software engineering, and structured systems analysis. Dakota State is regionally ranked by U.S. News and World Report as among the best regional universities in the Midwest and the 32nd top public school in the country. FSU is one of our top online schools for computer science primarily due to the affordable undergraduate tuition. Florida State University is one of our top online computer science schools due to the affordable undergraduate tuition and high graduation rate. The school offers an online computer science bachelor’s degree program that is designed for working students. Those with an AA degree may complete the program within just two years, although four-year options are available. All classes are delivered online and taught by the same professors who teach on campus. Classes include computer organization, ethical issues in computer science, introduction to UNIX, programming languages, and software engineering. Florida State is ranked by U.S. News and World Report as a top national university. It is one of our top picks for computer science schools online with a #34 ranking for best online bachelor’s programs in the nation. Thomas Edison State University offers online bachelor’s in computer science degrees that are affordable and accredited. Thomas Edison State University is one of the best online computer science schools on our list because of the low student-to-faculty ratio and affordable undergraduate tuition. Thomas Edison offers a BA in computer science degree program that may be completed entirely online. The program is designed with the working student in mind and blends a strong liberal arts foundation with a solid computer science background through its online classes. Required courses include data structures, operations research, problem analysis and solution, programming languages, software engineering, and switching theory and automata. The university is regionally ranked by U.S. News and World Report. Also, the online bachelor’s degree programs have earned recognition in prior publications of Best Colleges. Low tuition costs! Fort Hays State University is among our top 5 best online schools for computer science. Fort Hays State University is on our list of online computer science schools because of its extremely affordable undergraduate tuition, low student-to-faculty ratio, and moderately high graduation rate. The school offers undergraduates a bachelor’s in computer science that may be completed entirely online. Required courses include computer operating systems, data structures and algorithm design, foundations of computing, java programming, orientation to computer science, software engineering, and systems architecture. Fort Hays is regionally ranked by major publications like U.S. News and World Report. Also, the online bachelor’s programs, including the online computer science degree, are ranked #24 out of more than 1,200 surveyed programs. BYU offers affordability and high graduation rates. A top online school for computer science! Brigham Young University’s Idaho campus is one of the best online computer science schools on our list. Students may earn a bachelor’s in computer information technology degree entirely online. The program is perfect for those interested in the tech-savvy world but don’t have the time to attend traditional classes. All courses are delivered online and include database design and development, object oriented programming, system analysis and design, and systems security. A senior project and internship are also required. BYU is ranked by major publications like U.S. News and World Report as the 10th best regional college in the West. The affordable tuition and high graduation rate earn it a top spot on our list of computer science schools online. Penn State University lands a top spot on our list of best online schools for computer science! It is highly ranked! Pennsylvania State University is among the best online computer science schools on our list due to the high graduation rate, moderately low student-to-faculty ratio, and relatively low admissions selectivity. Students may earn a bachelor’s in information technology entirely online. There are also options for students to customize their degree, especially for those interested in business or software applications. All courses are delivered online and include information and organizations, organization of data, and networking and telecommunications. Penn State is ranked by major publications like Forbes magazine and U.S. News and World Report. In fact, U.S. News lists the school as the 50th best national university and 14th top public school in the country. Low student-to-faculty ratios earn Old Dominion a place on our list of best online schools for computer science. Old Dominion University is listed as one of the best online schools for computer science due to the low student-to-faculty ratio, affordable undergraduate tuition, and high graduation rate. Students may earn an online computer science bachelor’s degree with courses taught by the same instructors who teach on campus. All classes are delivered online and include computers in society, introduction to discrete structures, introduction to theoretical computer science, object-oriented programming languages, and principles of programming languages. Old Dominion is ranked by major publications like Forbes magazine and U.S. News and World Report. In fact, U.S. News ranks the school as a best national university and the online bachelor’s programs as #49 out of more than 1,200 programs. 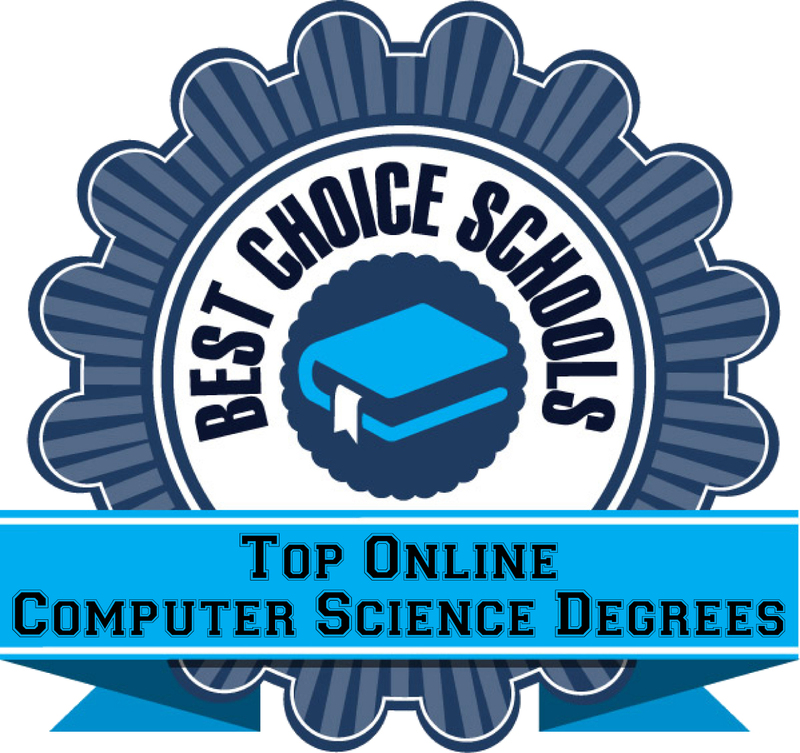 The University of Florida is the best online school for computer science on our list. The University of Florida is our #1 pick for best online schools for computer science due to affordable undergraduate tuition, high graduation rate, and selectivity. The school also has a relatively low student-to-faculty ratio, especially compared to other state universities. The online bachelor’s in computer science program provides students the freedom to tailor their classes to their interests and career goals. All classes are administered online and include applications of discrete structures, digital logic and computer systems, information and database systems, introduction to software engineering, programming fundamentals, and operating systems. The university is ranked as a top national university by U.S. News and World Report. Also, the online bachelor’s programs rank #11 out of more than 1,200 similar programs. The institution is one of the top online computer science schools in the country. This concludes our ranking of the 20 best online schools for computer science bachelor’s degrees in 2017.